Email campaigns have become very visual. Images don’t just add beauty to your email templates. They communicate your message better and even make your emails memorable for your audience. There’s science behind this concept too. Research has suggested that ​our brains process visuals faster than text and that visuals also affect our emotions. This greatly affects our decision making as well. While all this is true, creating the right image for email campaigns can be a challenge for many. Take the case of small businesses who do not have the budget to hire a professional photographer or illustrator. Or the case of an email marketer without the necessary HTML or design skills. Finding the right image to support your message can be tough, or even stressful at times. 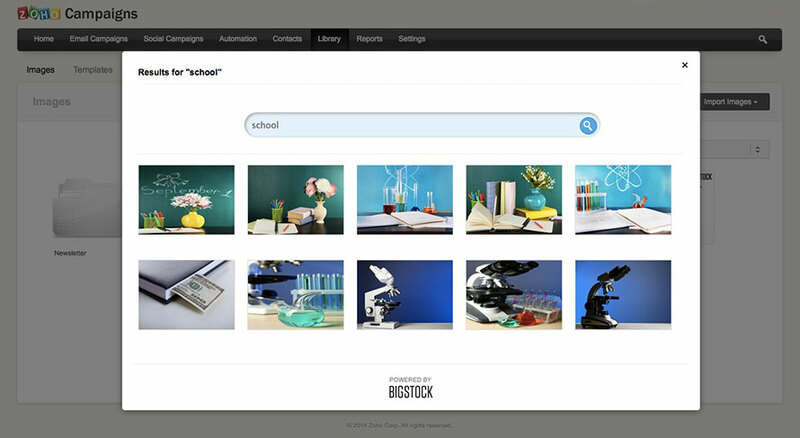 To help you find that perfect image with ease, Zoho Campaigns now integrates with Bigstock, the easy-to-use marketplace for high-quality stock imagery. You can browse through 22 million royalty free photographs and select images for your pre-designed templates or layouts – all from within your Zoho Campaigns account. You can use any image for just $5! Since these images that you purchase are added to your template library, you can re-use them for multiple campaigns – including Facebook page campaigns. This integration with Bigstock takes care of your mobile audience too. All templates and layouts in Zoho Campaigns are responsive and your emails will look good across multiple devices and formats. The Bigstock integration takes the guesswork out of adding images to email templates. All images selected will come through at the right size and resolution for pre-designed templates and layouts in Zoho Campaigns. Here’s the ​complete guide to using images from Bigstock for your email campaigns. Email marketing campaigns with images, when executed correctly, are known to increase click-through rates by 47%. Here are some best practices for selecting images that can help you create those powerful emails. Choose an image that is relevant to your message. Avoid using too many images in a single email template. Image-heavy email templates may be considered as spam by a number of email clients. Keep a balance between your text and images. All important information – like pricing, and contact details – must be in text. Don’t forget the ​alt-text. Many email clients block images by default. With the alt-text your readers can get the complete picture. Always test, test and test. You can run an A/B test on your email content with different images to understand your audience better. Go ahead and choose the right image for your email campaigns. Do let us know how your open and click-through rates are impacted. Is it possible to integrate GIF´s ,Flash, moving pictures to zoho campaigns? That would be very nice!!!! Nice Post on Email Campaign and Marketing. Looking forward to using this integration, this is a terrific feature addition. Curiously, right now, my image Library only offers options to Import Images from Picasa and Flickr. Will “Stock Images” be added soon? You must be able to see the integration in your account now. If you don’t see it, please write to support[at]zohocampaigns[dot]com and we will help you.